After Mike began his truck driving career, it was 7 months before we managed to work out the details of how I would meet up with him and get on board as his passenger while he was on the road. He lives in south Texas, over 600 miles from Albuquerque. His company’s home base is in Laredo, Texas, which is 200 miles from his house. The plan we worked out was that Lee and I drove to his house December 22 and spent Christmas with him and his family. The day after Christmas he was scheduled to go back to work. His first assignment was to take a load from Laredo, TX, to Atlanta. He would bobtail it to Laredo to get the load that was waiting in the Celedon yard. Since he wanted to leave at 5am I put myself and all my gear in the truck cab the night before and slept in the top bunk that would be my bed for the duration of our time on the road. The day before we left Mike’s house. This was going to be my copilot seat for the next two weeks. For the two weeks that I was on the road with Mike, I periodically wrote an entry in my blog. I have copied those entries to this page. It’s certainly not an easy life and with just this first delivery I have a new appreciation for the countless drivers out there who are pulling loads of product every which way across and up and down US highways. In the case of this load it was Wrigley gum going from Mexico to an eventual destination somewhere in Canada. Celadon’s part was to pick it up in Laredo, Texas, and deliver it to a warehouse in Atlanta, Georgia. We bobtailed (which means driving just the truck with no attached trailer) the day after Christmas leaving from Mike’s house in Brackettville, Texas, at 5:00 am. Three hours later we were at the Celadon facility in Laredo where we hooked up to the refrigerated trailer. I never would have thought that chewing gum needed refrigeration! Our first night out was sleeping (or trying to sleep) in the truck at a Pilot truck stop in Beaumont, Texas. To make our delivery time in Atlanta we had to leave there yesterday morning at 3:30 am. We got delayed by a traffic backup yesterday and didn’t quite make it to a truck stop last night before Mike ran out of driving hours. Instead, we overnighted in a Walmart parking lot just before the Alabama/Georgia border. Say what you will about there being too many Walmarts, but I was more than grateful to have a 24-hour access to bathroom facilities and a place in the morning to buy something for breakfast. After all, we had to be on the road by 3:00am this morning. The plan was to be in Atlanta (actually Kennesaw, GA) by 5:00am where we would drop the trailer and bobtail to Lebanon, TN, to pick up the next load. Mike did his part to make an on time delivery, but when he checked in at the warehouse office he was told that the shipper had left the “put away” number off of the paperwork. Since Mexico is in a later time zone it would be awhile before they could contact the shipper to get the number. We had to park for a couple of hours on a side street and wait for a call that we were cleared for unloading. 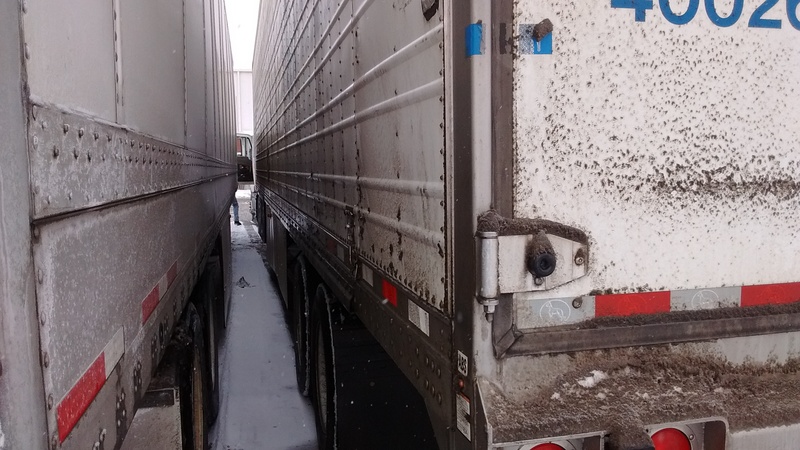 A “drop and hook” was the hoped for type of delivery, but when the call came that we could pull up to a loading dock, Mike was told that he would have to wait for the trailer to be unloaded before he could get back on the road. At some warehouses they let you hook up to an empty trailer and be on your way, but not this one. Besides the possibility of missing the next scheduled pickup, if too much time is wasted waiting at a site, then the driver doesn’t have enough on-duty hours left in the day to get as far down the road as he needs to get before he is required by law to shut down for the day. That eventuality is something called running down your 14-hour clock. But Mike and I are hopeful that we will soon get the word that the trailer is empty and ready for us to haul up to Tennessee. Keeping on trucking! 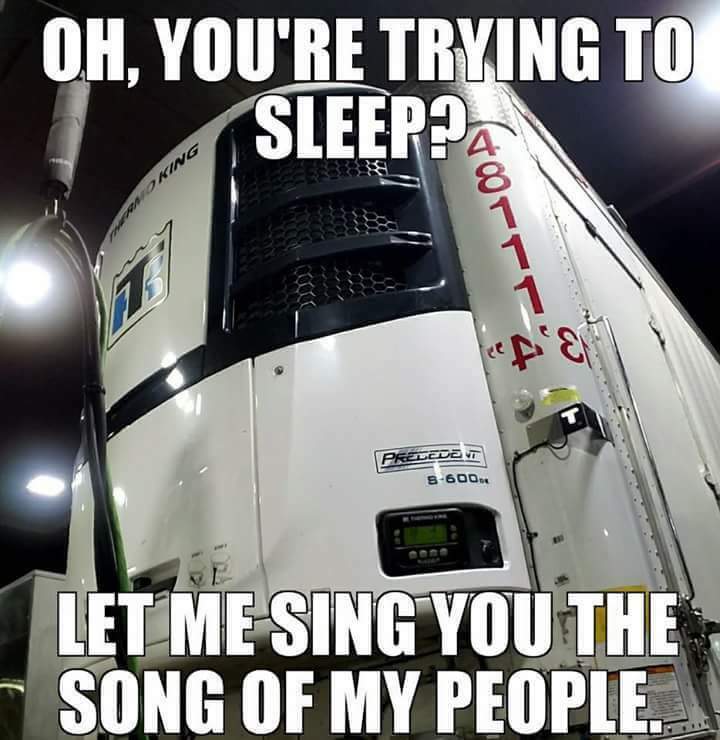 If you’ve never had the pleasure of bunking in the top berth of a big rig that’s hauling a refrigerated trailer across the country you might not catch the humor in the above photo. After a good chuckle, my comment was “that says it all.” Check out the photo from my previous blog and you will see that the trailer behind Mike’s Celadon tractor is a refrigerated unit just like this one. And that small window at the top of the cab is where I can look out at the world when I’m in my bunk. Which means that me and the Thermo King monster are up close and personal. I wasn’t thinking of it’s constant roar as a song but now this joke might give me a better attitude. I’ve found that a sense of humor is very helpful out on the highway. It’s a rough life and easy to find things that upset and annoy you. But as a sign I saw last night said “10 percent of life is what you make it and the other 90 percent is what it makes you.” I’m aiming to not let this experience make me a grumpy old woman who didn’t get her beauty rest. Instead I will try to learn the Thermo King tune and by the end of this trip I might go home having made a new friend. It’s a cold morning in upstate New York. The air isn’t the only thing that’s frozen. 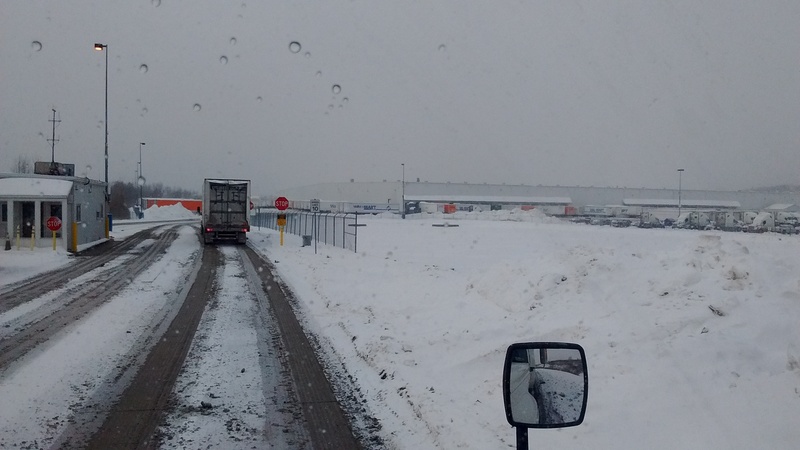 Our projected deliveries for Celadon this week are now on hold, through no fault of the hardworking driver who was doing his best to navigate the snowy highways. Speaking of snow, when one event causes a schedule delay it creates a snowball effect that impacts everything down the line. 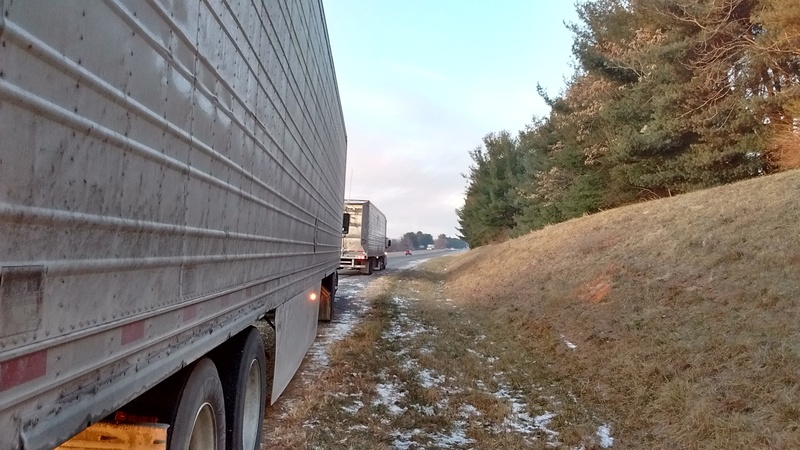 Thursday’s delivery in Atlanta that made us wait 3 hours while the shipper’s clerical error was resolved resulted in a late pickup at our next stop in Lebanon, TN. We spent the night Friday at a truck stop in Pennsylvania. Mike started driving at 1:30am as we began to see the first edge of the snowfall moving up from the south. As the morning progessed and the snow got heavier Mike had to keep stopping to clean off the wiper blades. About 6:00am at a rest stop where he had pulled over to get out and clean the wipers he came back in the truck with the news that one of his tires was flat. Since it was so early in the morning and we weren’t close to a big city it took awhile for Celadon to get a repair truck out to us. We lost 4 hours with that incident. Once we were back on the road it was slow going as the snowfall continued through most of the day. By noon we arrived at the delivery site in Johnstown NY. This delivery was a drop and hook which means we didn’t have to be scheduled for unloading. 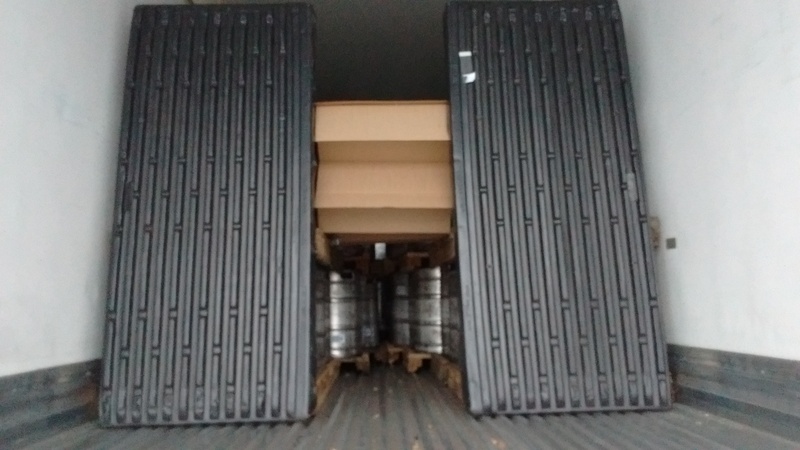 We could just unhook the trailer in a designated spot, find an empty Celadon trailer in the lot (amongst the many empties that belong to numerous other companies that deliver to this Walmart warehouse), hook up to the empty and be on our way. 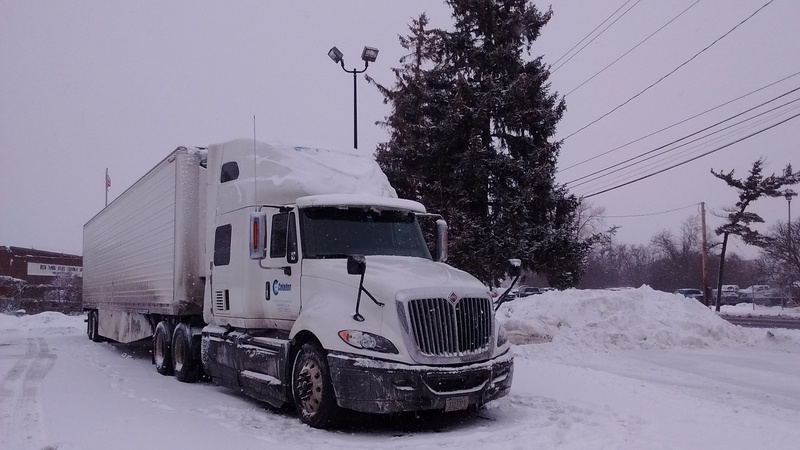 Meanwhile Mike was coordinating with Celadon and the shipper in Syracuse where we needed to pick up the next load. Unfortunately, this one was a live load and we would be late for the originally scheduled time. Because of the holiday weekend they couldn’t reschedule us until Tuesday and Celadon couldn’t find a different delivery for us either. We hauled the empty trailer towards Syracuse, getting to a service plaza on the toll road just east of Utica, NY, before Mike ran out of driving hours. There’s no reason to hit the road early today so we are enjoying a leisurely start to the morning. We’ve got an exciting weekend planned for our “frozen” driving adventure. Getting the flat tire fixed. A tight squeeze backing the trailer into the narrow assigned spot but Mike is an expert. Mike unhooking my friend the Thermo King trailer. I’ll make a new friend who will sing to me. 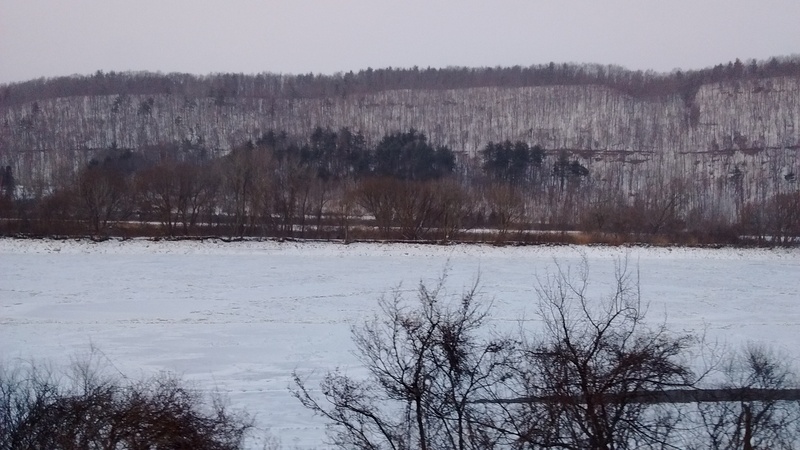 Frozen Mohawk River near Johnstown, NY. Snowy New Year’s Eve parked in New York. It was a relief to get back on the road yesterday morning after our 3-day delay. 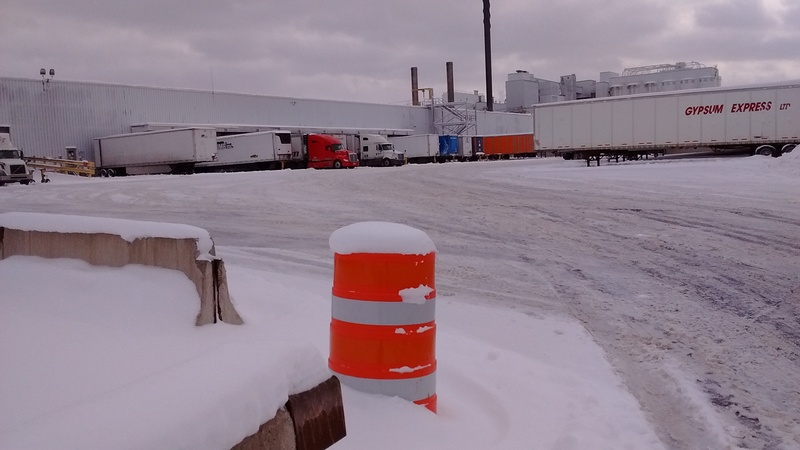 We left Syracuse early for our noon appointment at the Anheuser-Busch plant in Baldwinsville, NY, hoping they might be able to work us in early. No such luck. Six hours after our arrival the load was finally ready for us to start hauling to the destination in Tennessee. Load of Bud Light ready for the trip to Tennessee. The Qualcomm route plan wanted us to head west on the Thruway all the way across New York to Erie, PA, before turning south. That would have us driving right through the center of the winter storm we could already see was causing major traffic backups. Mike reprogrammed the route to head back down Interstate 81, the route that we had taken last week to get up to New York. That would add about 100 miles to our trip, but turned out to be a wise decision given the news this morning about how bad the situation was last night on the Thruway. Getting such a late start from Baldwinsville meant that Mike could only drive for 7 1/2 hours before he would have to shut down for 8 hours. Truckers are held to a confusing daily 14-hour “on duty” clock that limits the amount of time they can drive if they have spent too much time sitting and waiting at a customer site. I was a math major in college but I still haven’t figured out how available driving time works and how the driver “gets back” hours if he spends at least 8 hours parked somewhere. For us, and countless other truckers, the requirement to be parked somewhere for a number of hours can be a major hassle. The clock was ticking towards midnight and Mike was checking the app on his phone that showed available truck parking close to where his time would run out. 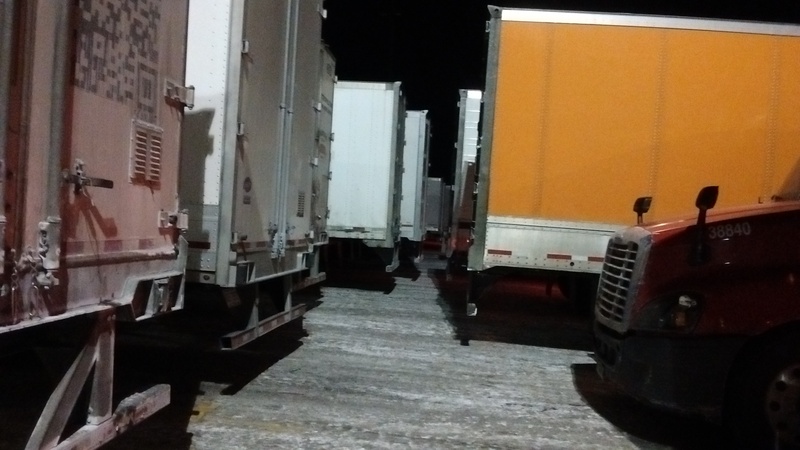 We thought we could find something at a Flying J near Winchester but when we got there the lot was jammed with trucks in every available spot and in spots I wouldn’t have considered available. We circled the lot several times, choosing finally to back into one space that looked like it might be big enough. It wasn’t. Meanwhile, Mike’s clock ran out. Our only option was a rest area 5 miles further down the highway. When we got there the situation was no better than at the Flying J. Every spot had a truck parked in it. We ended up jammed in a line of other desperate trucks parked on the shoulder of the rest area on-ramp. Not exactly legal parking and not exactly legal that we hadn’t shut down when the 14-hour clock expired. But there was no other choice. Consumers want their goods on time but don’t realize that having so many trucks on our highways means there will have to be places where they can stop. There are simply not enough truck parking areas along major highways. And, actually not enough truck parking in other places either. Our overnight parking spot, forced to park on the shoulder of Rest Area on ramp. One of the interesting parts of tagging along with Mike on his Celadon deliveries is figuring out what the heck we are transporting hither and yon around the US. This morning while waiting to get the scheduled load in Lebanon, TN, I googled the name on the sign at the Maplehurst bakery facility we had pulled into. When the company web page popped up displaying this yummy photo my stomach rumbled with hunger. What a temptation. Lee is always joking about us raiding what’s in the trailers we are hauling. I wasn’t at all tempted by the load of Bud Light we hauled up here to Tennessee but those baked goods sure look good. 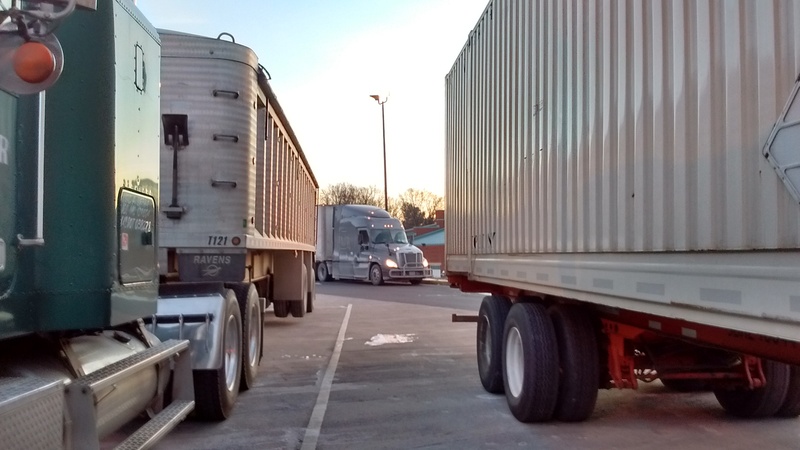 Last night as we approached the customer site where the beer was scheduled this morning for the unloading, we encountered the same situation as yesterday where none of the nearby truck stops had open spots. Fortunately, by using Google’s satellite imagery Mike was able to see that it was possible to park a truck in the back of the customer’s warehouse. The warehouse was located in a quiet, suburban Distribution Park and proved to be a better overnight spot than most of the others we’ve had. On the way in we had noticed a corner gas station and after parking the truck we walked through the bitter cold the half mile back to the station to see what provisions we could find. Just before we got there we saw the sign for a strip mall next to the station and one of the businesses listed was a Mexican restaurant. Our dinner there was a welcome reward after a long day of trucking. The baked goods now getting loaded into the trailer are going to Indianapolis, IN. As cold as the weather is here, it’s even colder up that way. If I had joined Mike during the summer months instead of January, I’m thinking I might have had more trouble spending so many hours in the truck. A short time out of the truck at this morning’s fuel stop convinced me that the warm truck cab is a pretty good place to spend the day. And we’ve got enough food stashed in the cab’s storage bins that I shouldn’t have to raid those baked goods in the trailer in the back. 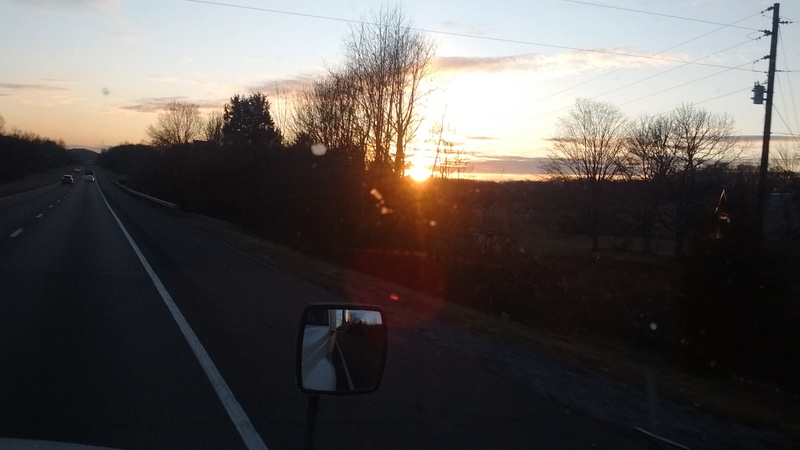 Sunset somewhere on the highway in Tennessee. I can remember setting up my tent many nights in a crowded RAGBRAI camping area with a concern that I wouldn’t be able to find my tent again in the dark, coming back from a trip to the restroom. That same concern hits me on the nights when we manage to find a spot to park the truck in an overcrowded truck stop. Threading my way through the rows of towering truck trailers makes me feel like an ant in a sea of grass. I always take my cell phone when I leave the truck so I can call Mike to rescue me if I lose my way. Mike gets us to where we need to be. Oops–Mike hadn’t been paying attention to the road signs that showed 109 turning left at the intersection. We weren’t in the left turn lane but the drivers behind us were patient enough to let us make the turn when the arrow finally turned green. 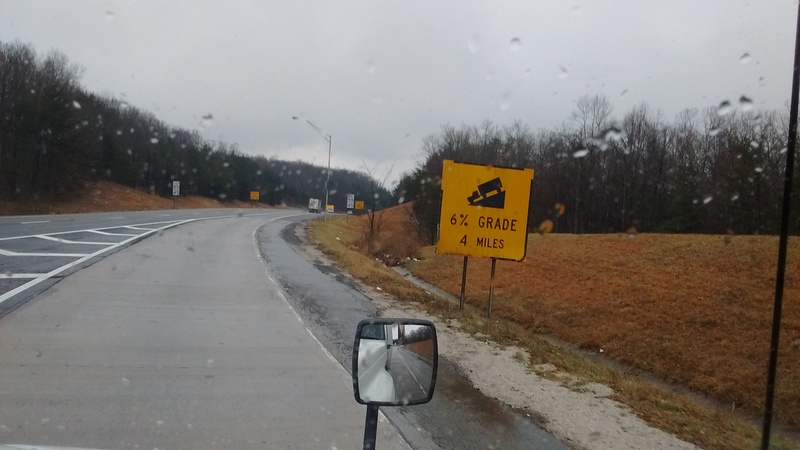 We were grateful to the kindhearted trucker who took the time to warn us of our impending error. Otherwise, we might have ended up in a situation like the one last week in Binghamton, NY. On I-81, driving south of Binghamton, I-86 splits off to the left towards New York City. We were going to Tennessee and needed to stay on I-81. It was after dark, Mike was tired and he made the mistake of going left at the fork on to I-86. We took the first exit, intending to turn around, only to find that there wasn’t an on ramp there to go back the way we had come. Our only choice was to proceed down the road we were on. In a car this wouldn’t be a problem–you would just turn around in the nearest driveway. No way you could do that in a fully loaded 18 wheeler. The road kept getting narrower as it wound through a rural neighborhood down towards the Susquehanna River. I had nightmares of us getting trapped at the end of the road with no way to turn around. Finally, though, the road intersected a two-lane highway that we were able to follow and find the next on ramp to I-86. We went back the other direction and corrected our mistake, thankful that it was only a short delay and not a major disaster. You think differently about where you can and can’t go with something as big as a semi-truck. 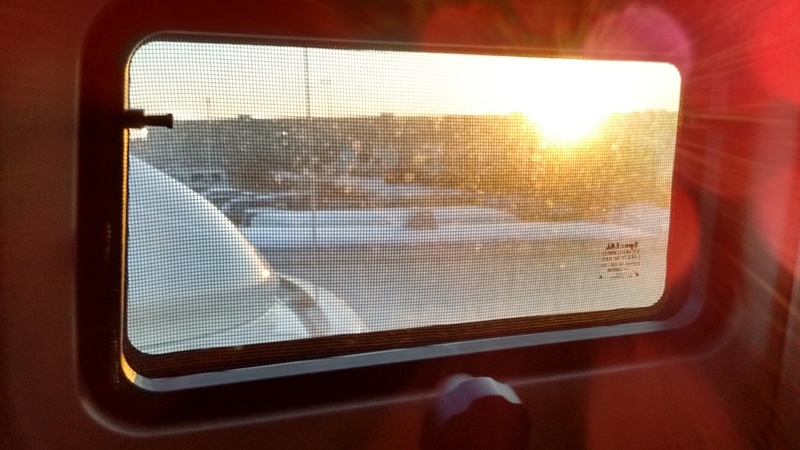 The sun is a welcome sight this morning looking out the window of my cubby in the top berth of Mike’s truck cab. 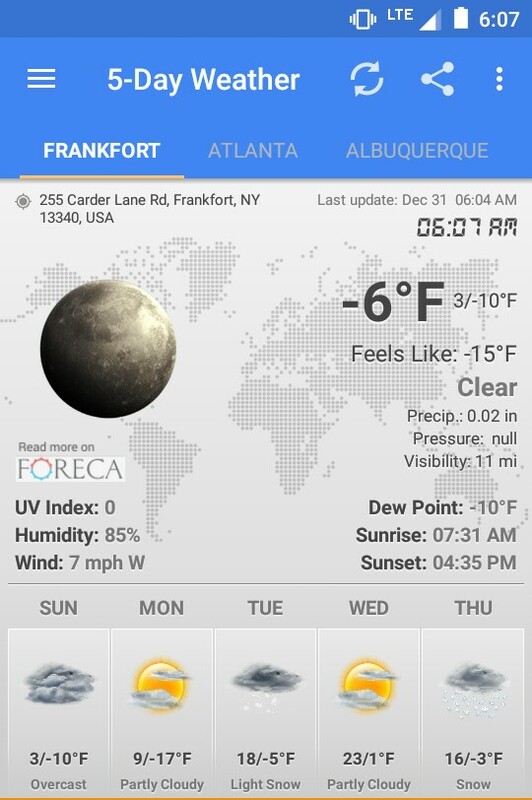 The weather app on my phone tells me that the temperature outside is -6 degrees (that is a NEGATIVE 6). I’m not anxious to venture out any time soon. Last night we parked the truck in the Celadon terminal in Indianapolis after a 24 hour layover at the Flying J truck stop in Lebanon, IN. That’s about 30 miles total of driving in the past 36 hours. No way to make a living when you get paid by the number of miles driven to complete a delivery. We still don’t have an estimated departure time for today. The next delivery is a relay, meaning another Celadon driver is bringing the load here to the Celadon terminal where Mike will then hook up to it and deliver it to the customer in Atlanta. The last word this morning was that the other driver still hadn’t picked it up on his end, which is a 5-hour drive from here. Because it’s now the weekend it’s difficult for Mike to get any information or assistance from the M-F, 9-5, Celadon administrative personnel. Drivers are expected to be on the job 24-7, but what a frustration when they can’t get the support that they need. I’m a big believer in looking on the bright side. Things don’t seem quite so bad in the bright morning sun. I give Mike a lot of credit for hanging in there because I know it’s much more frustrating for him. You know how the refrain of some ridiculous song will get stuck in your head and play like a broken record? After this trucking experience I’m going to keep hearing “A New Message Has Arrived” in the sing-song robotic voice that periodically squacks from the Qualcomm device mounted on the truck dashboard. Automated driver logs replace the paper logs truckers traditionally used to document their work. Besides tracking everything Mike is doing, the Qualcomm is his communication connection with home base. 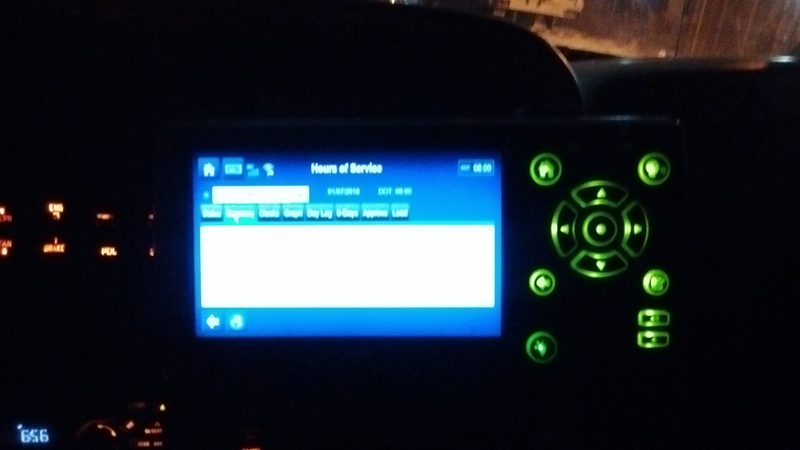 Often its messages are just “fleet broadcasts” that the company makes to all drivers. In other cases, its message is one that we have been parked for hours waiting to hear with information we need before we can proceed. We waited all day yesterday at the Celadon terminal waiting to hear that the load we were supposed to take to Atlanta was on its way. That message never came. Instead, at 4 in the afternoon Mike got a call offering him a new load assignment. 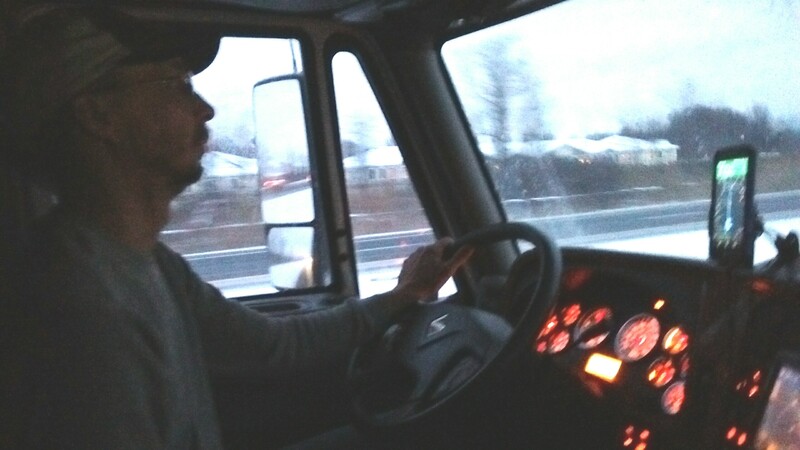 We were desperate to get moving again and Mike wasn’t deterred by the idea of a tight schedule on this new load and the fact that we had to drive into Chicago to get it. Before we showed up at the customer we needed to find an empty trailer. Supposedly, a third-party warehouse in Hammond, Indiana, had one on their lot. It would be close to the customer and we crossed our fingers that we would find it when we got there. Celadon seems to have problems keeping track of their trailers. 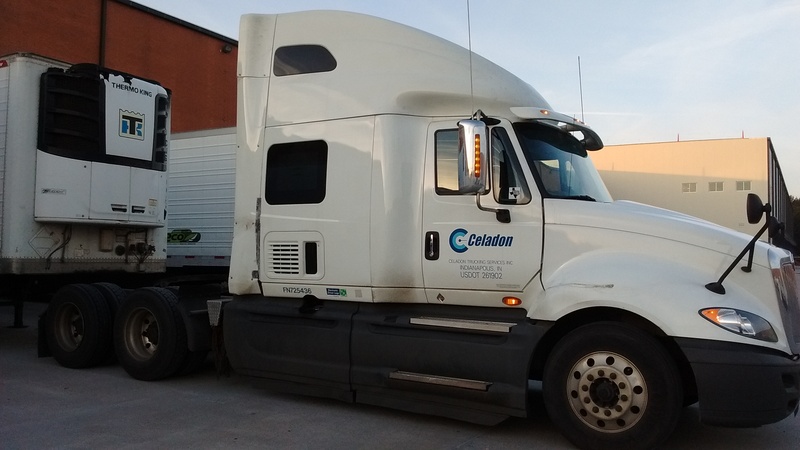 At Hammond, in the dark, with minutes ticking away, driving up and down rows of hundreds of truck trailers from multiple fleets, Mike managed to find the Celadon one that had the correct number. We hooked up to the trailer, navigated the rest of the way into Chicago and arrived at the customer with 30 minutes to spare. The Windy City was certainly more windy than down in Indy, but it didn’t seem quite as cold outside. Mike trudged into the shipping/receiving office with his paperwork, only to come back with the bad news of another delay. The paperwork he was given by Celadon didn’t have the correct pickup number. Someone back at home base (working late on a Saturday night) would have to investigate and get back in touch with us. Meanwhile, we would sit and wait in the truck on the customer site. I was awakened at 3am and again at 5:30am by the squack of the “A New Message Has Arrived.”. Unfortunately, neither message was the one we were waiting for. A live person from Celadon called at 7:00am, giving Mike a few more assurances that our predicament was being worked on. Stay tuned to find out when we get out of here and where we truck off to next. If you’ve been following along on this trucking adventure you know that yesterday morning we were still stranded at a warehouse in Chicago waiting for someone to message us the correct pickup number required by the warehouse before they would load our trailer. By noon we still hadn’t heard anything. 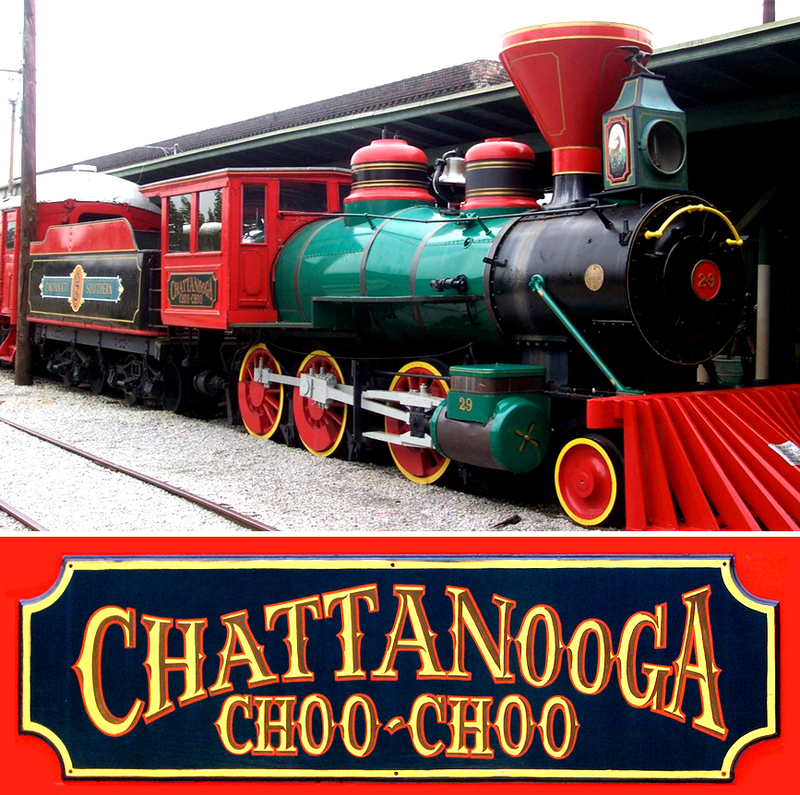 I think if the Chattanooga Choo Choo had come by we would have been tempted to use it to get us on our way. As it turned out, we didn’t need a train, after all, and were in our Celadon truck passing by Chattanooga, TN, this morning on our way to a delivery in Georgia. We never did get the load at the Chicago warehouse. Instead, when the orders finally came through Mike was told to drive to a nearby Celadon trailer storage lot, drop off the empty trailer and bobtail back down to Indy where a trailer would be ready for us to haul to Monroe, Georgia. This was actually the load we had been waiting for Saturday when we were parked at the Celadon terminal. Crazy shenanigans or what? Anyway, Mike put in a full 14 hours on his clock, picking up the load in Indy and getting to Manchester, TN, where we parked at a truck stop for the night. 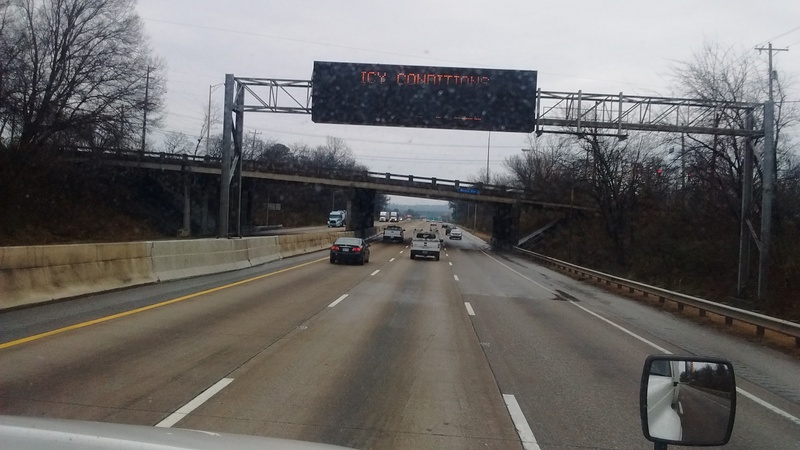 The next morning freezing rain was predicted on the highways we would be traveling in Tennessee and Georgia. 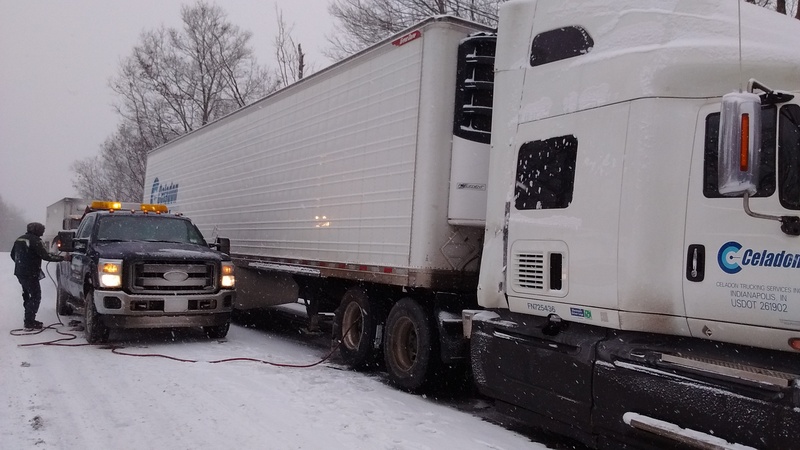 Parts of I-75 had already been shutdown because of weather related accidents. Mike calculated and recalculated hours and driving time trying to decide on the best time to leave. If he got to the customer site too early for the scheduled 6 pm unload time it would burn up his 14-hour clock and reduce the amount of driving time left for the next load we are picking up at a Celadon facility on the other side of Atlanta. If he waited too long to start driving, weather and traffic might slow us down and we would be late for the unloading. It was nice to see rain for a change but I sure wish it would have been just a few degrees warmer so the threat of icy roads wouldn’t be a concern. Approaching Chattanooga from the north there is a steep descent down the Cumberland Plateau. 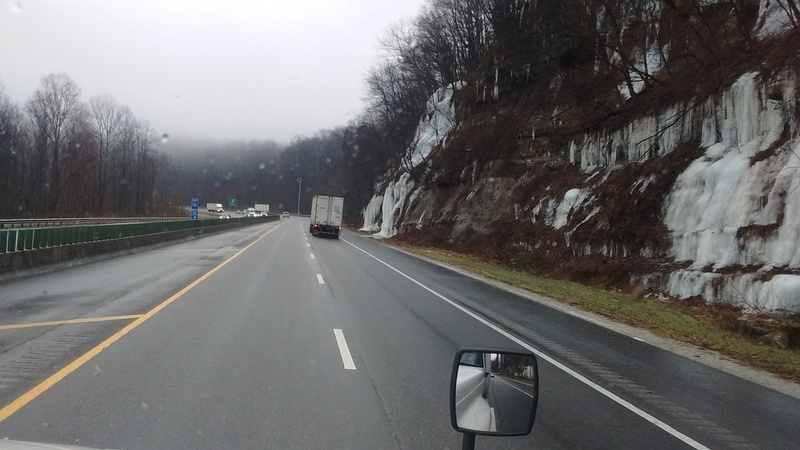 The roads were wet and trees along the roadside were covered in ice, but Mike was careful, as usual, and we made it to Chattanooga without incident. The rain was heavy at times as we approached Atlanta but we were ahead of rush hour and traffic wasn’t bad. We’re early for our appointment but it remains to be seen how long the unloading process will take. I think Mike said we can afford 2 (or was it 3) hours here before it impacts the 14-hour clock. Will I ever grasp the intricacies of maximizing available driving hours in this business? My trucking adventure has come to an end, and although it will be nice to get a shower and regular bed tonight, it was very sad to see the Celadon truck leaving the truck stop in Houston this morning and I wasn’t riding shotgun anymore. Starting December 26 from Brackettville, TX, going up to Georgia, Tennessee, and New York, then back down to Tennessee and Indiana, then up to Chicago and back down to Indiana and Georgia, my ride ended in Houston, TX. 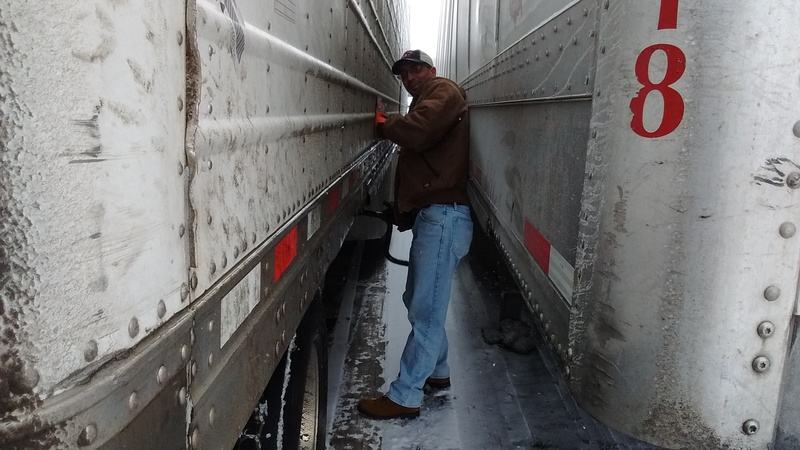 Mike continued on with the load he needs to deliver in Laredo this afternoon. It made sense for me to stop here because it is easier to get back to Albuquerque from Houston than it would have been from Laredo. In spite of all the hardships, it was an awesome two weeks and I’m grateful for the opportunity to spend this time with Mike and get a better understanding of what the life of a trucker is like. When I’m back to being a passenger or driver of a “four-wheeler” I’m going to be more tolerant of the trucks zooming by on the highway or crowding into the truck stops. Those drivers work hard and it takes a special skill and knowledge to safely maneuver such a huge, powerful machine. In spite of what Mike says, that “anybody can learn to do it”, I certainly could not do all of what he had to accomplish to successfully meet the assignments he was given. It was challenging enough just to be a passenger!